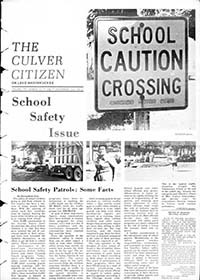 Complete run of 1973 Culver Citizen newspapers now online! The Vietnam War was winding down…Nixon hadn’t yet resigned…and Culver Community High School was just five years old, two drug stores in Culver still had soda fountains, and Culver Academy for Girls was just two years old. It was 1973 in Culver, and the entire year is available, full-text and searchable, to add to our existing collection of more than 20 years’ worth of Culver newspapers, which can be accessed here. Choose a link below to start your trip back to `73.